UNIVERSITY PARK — Criticism of the Penn State basketball team’s late-game ineptitude gained traction with each missed shot in the final minutes of regulation against Nebraska Friday night. Plagued by offensive inefficiency, the Lions squandered a 16-point second-half lead on their home court. The Lions’ prolonged drought forced overtime, where Tony Carr, who was a cold 2-for-16 from the field during regulation, made a game-winning jump shot to seal a victory, 76-74. After losing to Indiana, Penn State found itself with a 2-3 conference record with it’s toughest Big Ten opponents ahead. Riding another impressive outing by Lamar Stevens, the Lions narrowly avoided fully slipping into irrelevance. 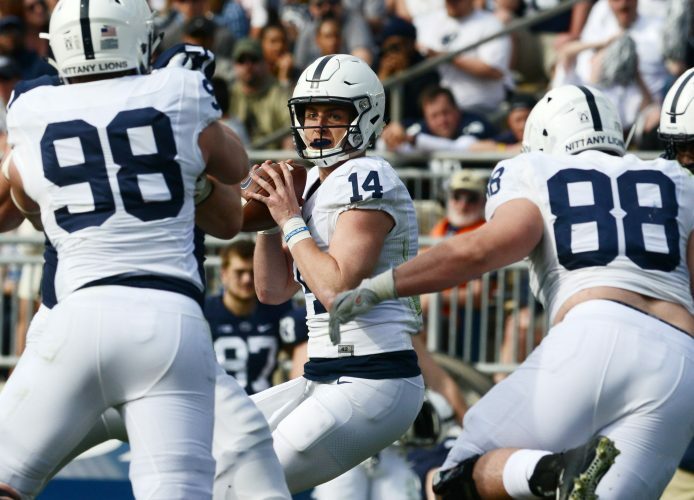 Stevens has taken a much more significant role in Penn State’s offense in recent outings. The theme continued into the Bryce Jordan Center on Friday night. For the third game in a row, Stevens recorded over 20 points. Carr, who leads the team with 18.9 points per game, couldn’t get in rhythm against the Cornhuskers. For most of the game, the guard was ineffective. However, Carr carried his team in overtime. Both teams struggled with poor shooting. With less than for minutes left in the first half, the teams were a combined 16-50 from the field. The Lions finished the half on a 7-0 run and took a 33-24 lead into halftime. The momentum carried over the break, as the Lions opened the second half with six unanswered points. Glynn Watson Jr. and Isaac Copeland led the Cornhuskers out of their lull. The duo both finished with 21 points. Both offenses caught fire following the Lions’ initial second-half run. The teams went a combined 8-for-8 from the field. After the shootout, the Lions grew their lead to 16 and looked like they would cruise to an easy win. However, Stevens and Mike Watkins, who finished with 20 points and 15 rebounds, couldn’t carry the team by themselves. Miles implemented a trap-based defense to limit the Lions’ offense. Chambers praised Miles’ strategic move. Senior Shep Garner scored only six points. Freshman Jamari Wheeler started in place of Josh Reaves, who is missing his second consecutive game due to academic reasons. Even though Wheeler maintained Reaves’s relentless defensive style, the guard struggled to mimic the junior’s offensive production. Wheeler didn’t score, missing all four attempts. Soon after the mid-point of the second half, things started to fall apart for the Lions. The Cornhuskers went on a 14-2 run to cut the Lions’ lead to one. The Lions’ drought, which featured a 1-for-10 shooting effort from the field, lasted until the final two minutes. The teams traded shots until the final overtime buzzer. The Lions’ biggest issue this season has been consistency. The group has a tendency to fall into a lull following wins. If the Lions hope to revive their season and make a push for meaningful postseason play, they will need to keep their small spark of momentum going against Minnesota at home on Monday. “It’s definitely make or break,” Carr said. NEBRASKA (12-7): Copeland 7-13 5-7 21, Okeke 0-1 0-0 0, Watson 7-20 4-6 21, Taylor 0-4 0-0 0, Palmer 1-9 3-4 5, Borchardt 0-0 0-2 0, McVeigh 0-1 0-0 0, Roby 4-7 3-5 12, Allen 2-5 0-0 5, Gill 4-8 0-0 10. Totals 25-68 15-24 74. PENN STATE (13-6): Watkins 7-8 6-8 20, Stevens 10-18 4-5 26, Carr 5-21 4-6 17, Wheeler 0-4 0-0 0, Garner 2-5 0-0 6, Buttrick 0-2 0-0 0, Moore 0-1 0-0 0, Zemgulis 0-1 0-0 0, Bostick 2-6 3-5 7. Totals 26-66 17-24 76.